Samlerhuset donates original WWII heavy water to the public - Samlerhuset Group B.V.
Thor Olav Sperre from Sperre AS and Managing Director of Samlerhuset Norway, Vibece Furseth, at Lake Tinn in Telemark, Norway. During World War II, a series of joint allied sabotages, on the the Vemork Powerplant in Telemark, Norway, prevented Hitler from getting enough of the heavy water he needed for producing nuclear weapons. The heavy water is part of the joint history of Norway, and Samlerhuset joined forces to rescue some of it from the bottom of the lake where it has rested for over 70 years. 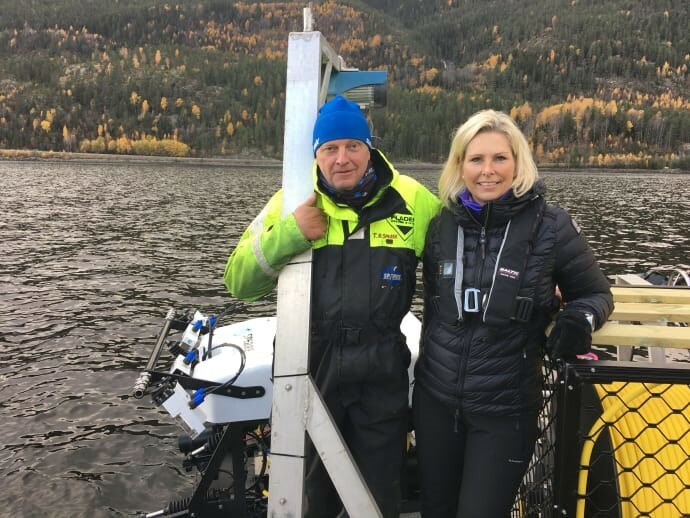 By using a so-called Remotely Operated Underwater Vehicle (ROV), Samlerhuset and the Deuterium Foundation (Stifelsen Deuterium) paid a visit the war memorial Unesco site where the wreck of the ferry «DF Hydro» rests at 430 meters depth in Lake Tinn in Telemark, Norway. High quality images and videos was taken to document the wreck and the heavy water barrels from the famous 1944 WWII event where Norwegian saboteurs sank the ferry to prevent the Nazis from moving the heavy water to Germany in an attempt to complete their atom bomb. Various museums received heavy water from the original 1944 cargo, and Samlerhuset handed out ampoules of 5ml of heavy water to historically interested Norwegians. The dive down to the ferry wreck was conducted purely for historic documentation and research purposes. DF Hydro was sunk on February 20 1944, and now rests at 430 meters depth in Lake Tinn in Telemark, Norway. This was the last sabotage attack following a series of operations undertaken by Norwegian and British saboteurs during World War II to prevent the German nuclear weapon project from acquiring heavy water (deuterium oxide). The most famous part was the so-called “Operation Gunnerside” from 1943, where Norwegian saboteurs succeeded in destroying the heavy water production facility. “Operation Gunnerside” was later evaluated by British Special Operation Executive as the most successful act of sabotage in all of World War II. If unsuccessful, these events could have changed the outcome of the war. Rjukan-Notodden Industrial Heritage, including the Vemork Powerplant and the DF Hydro ferry, is protected by Unesco. Although the sabotage operation is considered a success, 18 out of 47 people died. The dive was therefore conducted by a ROV often used in the offshore industry, and with great respect for the victims, neither the wreck nor any other objects was affected during our research operation. – A pre-condition for joining the research project was that nothing from the wreck or surrounding objects would be affected. We do not want anyone to feel insulted in any way. Our goal is to document history and tell it to the masses through updated high quality images and videos. Norway’s resistance forces and their struggles during World War II must never be forgotten, says Vibece Furseth, MD of Samlerhuset Norway. In 1993 and 2004, two and one barrel of heavy water respectively was collected by the Deuterium Foundation with assistance from Sperre AS, for documentation and research carried out by SINTEF, Scandinavia’s largest independent research organization. The heavy water, located about 50-60 meters from the wreck of DF Hydro, was brought to the surface in agreement with Hydro ASA. However, it is no longer permitted to collect anything from the wreck or its cargo due to new war heritage protection regulations. Thor Olav Sperre in Sperre AS has been the driver behind the project for a number of years; – Since the late 80’s, we have been working on the DF Hydro project. Today’s technology provides high quality footage of the wreck and the surrounding objects, at the same time ensuring high precision work so that nothing is affected. This will help to educate people about the sabotage operations that might have been crucial in preventing Nazi Germany in developing nuclear weapons. The original heavy water barrels have been stored in a garage since the were brought to the surface, and we are pleased that the historical content is finally released for museums and history enthusiasts. Samlerhuset, one of Europe’s largest collector companies, was given the exclusive right to use the heavy water in order to tell the important history through collectables, and donated the original WWII heavy water to museums and the Norwegian people inside small ampoules. The heavy water originates from barrel 26, and the actual empty barrel can be seen at the National World War II Museum in New Orleans, USA. -All parties involved in this very interesting project see the importance in that WWII history lives on for future generations, and that making footage and historical documentation such as this available to everyone ensures that we learn more about the Norwegian and allied resistance fight during the war. Therefore, we donated original WWII heavy water from DF Hydro free to relevant museums, such as the Norwegian Resistance Museum, as well as to historically interested Norwegians, says Vibece Furseth, MD of Samlerhuset Norway.